The Good, The Bad, & The Ugly... First Drafts! Now that you developed your characters, created your world, and outlined, it's time to actually sit down and write your first draft. This can be a scary proposition if you're working on your first novel. Before I started writing Renegades, I really took my time outlining and developing my characters--probably more time than I needed to because actually writing the book seemed daunting. But don't fear! If you've done the necessary preparations then just jump in. Last month, I participated in NaNoWriMo (National Novel Writing Month) and wrote 50,191 words of my second novel, Redemption. I'm still chugging away on the first draft. I estimate that it'll end up around 80,000 words, like the first draft of Renegades did. For me, the hardest part of writing the first draft is finding the time to write it. Unless you're being bankrolled by your parents or independently wealthy (lucky you! ), you likely have a day job and other responsibilities like families, pets, etc. While writing a first draft, you have to be selfish about your writing time. I went to Las Vegas for Thanksgiving with my boyfriend and brother, and even there, I passed on activities and gambling (probably best for my wallet) to make sure I hit my word count for NaNoWriMo. You may have to wake up earlier or do multiple 15 minute writing sprints throughout the day--whatever works for you--to get it done, but you have to be consistent unless it'll either take much longer than necessary or it won't get finished. Once you've carved out time to write, you just need to write. Sounds easy, huh? Some days it is, and some days it isn't. Even on the days when you sit down and you can't think of what to write and stare at your computer for a while, you just need to start typing. This is where your outline comes into play. As you're writing, you may deviate from your outline, which is fine (I actually encourage it), but when you're stuck, go to where you are in your outline and just go. Lastly, don't stop to edit or look over grammar. Just get the words down. If you forget a character's name or some other minor detail, just make something up, highlight, and keep going. I think this is hugely important. Editing and rewriting took me more time than writing the first draft, but they were separate steps. Don't get bogged down in the details for your first draft, or it'll be even more difficult to finish. One of my favorite quotes is "You can't edit a blank page." You can always go back, and should go back, to pick a better word, correct sentence structure and grammar, and add/subtract things from your plot. But for your first draft, just get it done. That by itself is a huge accomplishment. Once you're done, have a drink and don't think about your book for a few days or a weeks. Then comes the hard part--editing and rewriting. If you want updates on when my second novel, Redemption, will be released, make sure you sign up for my newsletter! When I started outlining Renegades, I must admit that I didn't give much thought to creating the universe in which the story was taking a place. Renegades take place in a different star system in a world where Earth never existed, but the people are like normal people and there are no aliens. (This greatly confused at least one of my aunts, but she only reads romance novels and not any science fiction/fantasy, so I'm just going to ignore her.) I had given all the planets names and had an idea in my head of what I wanted them to look like. Some were very industrialized, while others were more primitive. I was trying to create a sense of the have and the have nots in a different star system. But besides planet and city names and general ideas, I didn't do much else on world creation until after I outlined. As I was preparing my character descriptions, I found myself creating a lot of the world around them. For example, it's important to figure out your characters' religions and belief systems. Mine was pretty easy because I already knew that I wanted my story to take place in a world without religion, so all my characters are atheists. I could go on, but those are the basics every author should know about their world. If you're writing hard science fiction then there are even more details you need to know. I also think it's helpful to draw a map of your world whether you have different planets or everything takes place on one planet. My drawing skills are sub par, but a sketch is all you would need. I even included details about how long it takes to travel between each planet by my preferred method of travel. These are details your readers will think of, so you need to have the answers! Hope that helps. 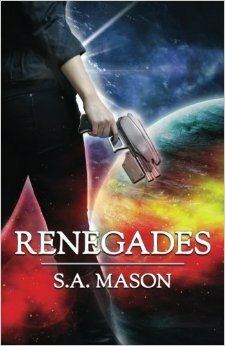 And if you haven't yet, you can enter to win a signed copy of Renegades on Goodreads! And don't forget to sign up for my newsletter. Giveaway ends December 04, 2013. Enter to win one of ten signed copies of Renegades! You have to enter by December 4th! Now that you've written your outline, it's time to start developing your characters. This step is critical to writing a compelling novel. Since you've written an outline, you probably have a fairly good idea about who your main character are going to be, but this step is still important. If you want the reader to connect with your characters then you have to make them seem real. First, look at your outline and think about the dramatic plot points. What type of characters are going to make those possible? For example, Renegades required a person capable of hacking government security systems. So what was the profession of one of my characters? The developer of the government security system. I also needed my team of renegades to be able to travel freely around the star system, so I made sure that one of the people they teamed up with happened to own a ship. A lot of the time, the needs of your story will dictate the characters you have to create. Second, make your characters believable within the context of your story. If your female heroine is a superhero or in a fantasy novel then it's fine that she has super-human strength. If she's not a superhero then you might want to make her strength more believable. If you make a character that can hack a government security system who hasn't worked in that field before, you need to explain where he acquired those skills unless readers won't take the story seriously. Third, remember, no one is perfect. Every character, even the protagonist, must have some type of character flaw. Have you ever met a person who was seemingly perfect in real life? I have before, and I wanted to punch her in the face. No one likes those people. The reader wanting to punch your character in the face is not good (unless that's what you want, of course). Fourth, everyone has a distinct voice. Think about the conversations you have with people. If they were transcribed for you to read, it's likely you'd be able to pick out who said what without any speech tags. Although you need to use speech tags in your writing to assist the reader, you should be able to read a transcript of the dialogue from your novel and know which character is saying what. If everything sounds the same then the characters aren't developed enough. Lastly, know so much more about your characters than what you write in your novel. Before I wrote a word of my first draft, I had several pages of notes on each main character. I knew their birth dates, parents' names, siblings, where they lived, what their motivations were, what they studied, physical characteristics, what they enjoyed to do in their free time, strengths and weaknesses, etc. You certainly don't have to reveal all this information in your novel, but knowing each character like he/she is your best friend will help you write them more realistically. Hope this helps with your character development! Next up: World creation!